The Westchester Oratorio Society (WOS) was founded in 1997 with the following mission and purposes: To cultivate, promote, sponsor, and develop among our members, the local community, and general public an interest in, appreciation of, understanding of and taste for choral music, with particular emphasis on the complete spectrum of oratorio music from ancient to contemporary; to stimulate interest in such music in the community by producing musical performances featuring oratorio works; and to promote interest in oratorio music by providing opportunities for professional and nonprofessional musicians and community members. The Westchester Oratorio Society was named "The Best Amateur Chorus" by Westchester Magazine in their July, 2002 "Best of Westchester" issue. 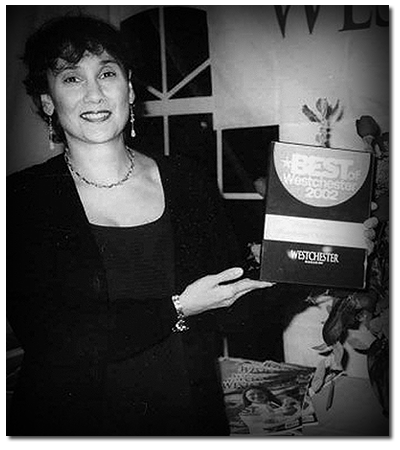 WOS Board Member, Joy Travalino, accepted the award on behalf of the organization at a reception held at Harvest-on-Hudson in Hastings on September 23, 2002.